Izrael Lejzerowicz worked in several distinct genres. By the 1930s he was well known as a portrait painter. You can find many examples of that in the galleries in this website. During the ghetto period, Lejzerowicz continued to create numerous drawings of people in the ghetto. Many of these original works are in the collections of the Jewish Historical Institute in Warsaw and not yet online. Most of the subjects were members of the ghetto elite, although there are also some striking drawings of poor people. Drawing the elite was doubtless helpful to the artist in maintaining his good connections to the ghetto’s leadership and thereby ensuring him some protection. 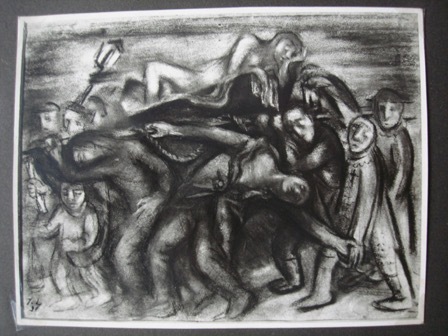 But there is another current in his work starting in the 1920s: symbolic, religious, and visionary drawings. The photograph above, showing a work that has now disappeared, is dated 1937 (or, possibly, 1931). Its meaning is unclear. Is it a theater troupe? Are the two figures on the right side clowns? commedia dell’arte stock characters? or perhaps churchmen? Is it an allegorical painting? What exactly is being portrayed? Why do these people - seemingly only men - appear to be carrying or pushing a naked woman on some kind of conveyance through the streets? Does she represent desire? sexuality? What kind of procession is this? Is it a funeral? Does anyone recognize this story? If it’s an allegory, does it represent a well-known phrase? There are multiple works in similar styles in the web galleries. Your thoughts and comments are invited!